With horses, the general belief often is, "He's naturally a big, strong animal," and little or no thought is given to how important training to increase strength is in helping the horse become not only an outstanding athlete, but also in helping to prevent injuries. When formulating a strength training program for your horse, it is important to determine whether the primary requirement in the muscles is for power or for endurance. This will depend on the particular sport or competition in which your horse will be engaged. To be successful, a strength training program is based on knowledge of the movements and muscular actions involved in the sport or competition so that exercises will simulate the range and speed of motion used in the competition. As a component of muscular fitness, improvement in muscular strength in the muscles not only enhances performance, but also reduces injuries by stabilizing the joints more effectively and preventing muscle strains. Although some humans work to develop muscles just to become more muscular, muscle building for its own sake is counter productive with horses. Bigger muscles that are not relevant to the work at hand increase weight, and too much body weight becomes a burden and poses problems for the athlete, whether man or horse. You get the picture: Heavily muscled horses jumping? Heavily muscled horses engaging in racing or endurance event? Not only does the extra muscle weight slow the horse down, but bulky muscles around a joint reduce the range of motion and the spring in the jump or step. The exercises should be specific for the muscle groups and for the type of contractions used in the competitions. Low intensity exercise cannot prepare the muscles for high intensity athletic performance. --Hilary M. Clayton, "Conditioning Sport Horses"
Since the force of the contraction is the most important variable in strength training, methods include working with more impulsion, carrying or pulling more weight, working on steeper hills or jumping higher fences are the kinds of activities that provide the most benefit in strength training. Also, the speed of the movement should be the same as the speed of contraction used in the actual sport to give the horse the maximum benefit from the exercise. Research shows that relatively short sessions of approximately 20 minutes work well when training for strength. The number of repetitions of the exercise movements are more important than the length of time spent. As the working muscle fibers become fatigued, other muscle fibers have to step up to the plate, so to speak, and the number of repetitions necessary to get all muscle fibers working is inversely related to the intensity of the contraction. While low intensity repetitions help improve muscular endurance, high intensity repetitions lead to muscle contractions that emphasize development of strength and power. In other words, the more the repetitions, the more muscle fibers become engaged and the higher the intensity, the greater the development of strength and power. Research shows that it is best not to work a horse to the point of exhaustion because of the vulnerability of the tendons, ligaments and supporting muscles. When signs of fatigue appear, it is best to stop strenuous work and begin the warm down to avoid the danger of injury. Generally, conditioning on a loose, deep surface and riding through snow or water, helps strengthen specific muscle groups, while also increasing cardiovascular loading and encouraging active joint flexion through a wide range of motion. 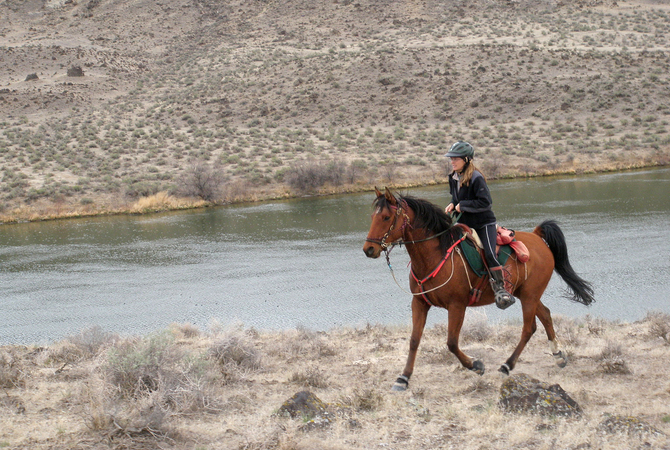 The use of gradients on hills or other terrain is an outstanding way of strength training your equine. Using gradients can be approached from several different angles and all gaits can be used, thereby providing a variety of strength-building activities. Uphill gradients help improve cardiovascular fitness and steep uphill gradients improve strength in the hindquarters whether at a walk or a canter. Trotting exercises on a moderate incline are especially beneficial to endurance and combined driving horses that will encounter gradients during competitions. Gradual downhill work is beneficial for sports that require a high degree of collection. Working through a series of forward movements, halting, and reining back on a downhill gradient improves both strength and balance. Walking down steep downhill slopes relies heavily on eccentric muscular contractions and are useful strength training exercise for horses that compete in endurance racing, reining, cutting, polo, and combined driving. Downhill conditioning at a trot or canter is good exercise for horses that are being prepared for eventing, combined driving and endurance racing. Because this type of exercise creates stress on joints, it should be limited. Working across slopes, especially for horses that are asymmetrical on the sides helps the weaker limb work in a more flexed position when it is positioned on the uphill side of the slope. Working back and forth across a slope helps develop the strength of both hind legs symmetrically. Gymnastic jumping is excellent exercise for strength training for jumpers and eventers. Jumping grids can vary in height, width, number of fences and the distance between them, and can easily be changed or manipulated to meet requirements for different sports. Uphill and downhill steps can be incorporated into strength training. Uphill steps develop power in the hind legs similar to that achieved in bounding up a steep gradient. Jumping down steps helps the eccentric contractions of muscles in the front legs making it effective strength training for sports where horses must cope with downhill gradients. Some of the best strength training occurs when the horse drops down the step from a standstill then springs back up immediately. Progressive loading is accomplished by increasing the number of repetitions and then by increasing the height of the step. In all strength training, it is extremely important to control the duration and intensity of the training. Muscular strains can occur when too much training is done on a too frequent basis. Local pain, muscular spasms, loss of strength and locomotor problems occur with too much training. If this happens with your horse, immediate treatment with application of cold therapy via cold water hosing, use of ice packs or other therapy for 10 minute periods repeated frequently over 48 hours is necessary. Anti-inflammatory drugs may be administered, and rest is essential in the early stages of recovery. To prevent recurring problems, exercise should be reintroduced gradually after the horse has had time to recuperate fully. whether the primary requirement in the muscles is for power or for endurance. Whether the primary training requirement of the muscles is for power or for endurance depends on the particular sport or competition in which your horse will be engaged. To be successful, your strength training program should be based on knowledge of the movements and muscular actions involved so that exercises will simulate the range and speed of motion used in that sport or competition.